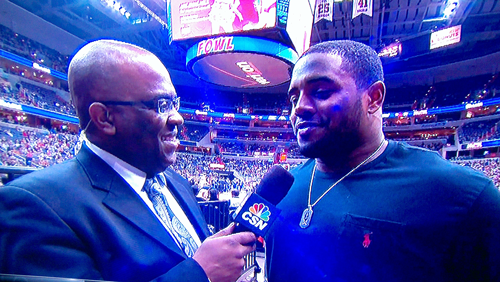 During Tuesday's Washington Wizards game against the Dallas Mavericks, Comcast's Chris Miller pulled Washington Redskins Fullback Darrel Young out of the crowd to talk a little Redskins. Young kind of revealed some of his thoughts about the media, which most likely has been locker room foder down at Redskins Park all year. "A lot of people counted us out. Whether it be Michael Wilbon, whether it be Stephen A. Smith, he said we aren't making the playoffs, but now "oh this team can do something"...You know...Whatever man..."
"I've been here when the team was terrible, can't say terrible, but we weren't what we are today"
"Just walkin' in the mall, everyone knows who you are"
Really? They flashed his name under his picture and it took me a minute to realize who it was.